One of the less formal but most important functions of parish ministry entails providing counseling to parishioners in need of sympathetic hearing and understanding advice from someone they personally know and trust. 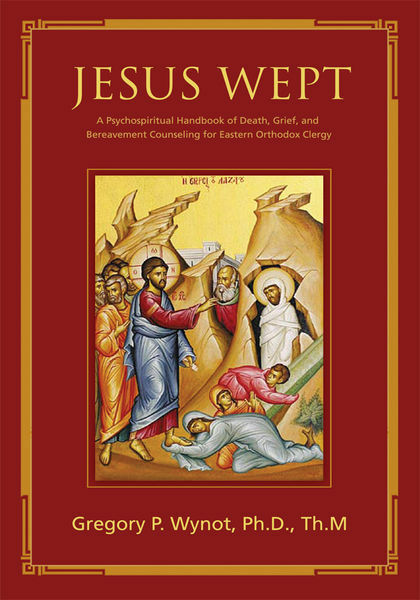 Jesus Wept provides a theological, psychological, and doctrinal foundation of the Eastern Orthodox Christian view of death that counselors can pass along to help the bereaved place the decedent’s passing into proper spiritual context. It also discusses the psychological, functional, and spiritual aspects of the Eastern Orthodox funeral services. Author Gregory P. Wynot, Sr. focuses on the especially traumatic circumstances connected with the death of a family member or loved one and details the stages of dying and the grieving process. He also discusses how to diagnose and categorize different kinds of grief as well as how best to approach specific situations. Finally, Wynot looks at the impact of bereavement counseling on the counselor, who must find a delicate balance between being a “spiritual father” and psychological “caregiver”. Also included are resource appendices and a bibliography for further reading. Jesus Wept is an invaluable resource that can ease the burden of what is certainly one of the most challenging tasks any counselor is called upon to perform. Author by : Gregory P. Wynot, Sr.